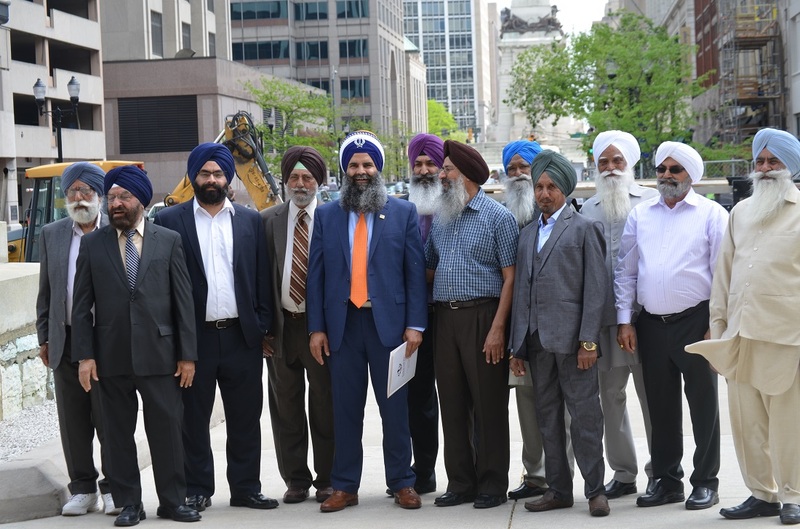 The Sikh Community in Indiana, along with Gurinder Singh Khalsa (fifth from left) has stepped up to show support to federal workers. The Sikh community will be delivering $5,000 worth of hot food and $5,000 in gift/grocery cards to TSA agents at Indianapolis airport. As the government shutdown entered it 33rd today, with no sign of an end in sight, news is coming up from all corners of the country on how the federal workers are getting affected. While some are approaching soup kitchens, food banks or are looking at CARE packages to get through, the Sikh community in Indiana has decided to spring up into action. The Sikh community of Fishers, Indiana, and Gurinder Singh Khalsa of SikhsPAC, a national Sikh political action committee, are coordinating with Mario Rodriguez, Executive Director of the Indianapolis Airport Authority, and Aaron Batt, TSA Federal Security Director, to support Indianapolis Airport TSA agents, who are impacted by the extended government shutdown. “The community has come forward and is keen to support the workers who are undergoing the crisis of missing their pay checks,” Khalsa told the American Bazaar. He said that $5,000 in gift/grocery cards and more than $5,000 worth of hot food will be delivered to TSA agents at the Indianapolis Airport on Monday afternoon, January 28. Leading the community efforts, Khalsa is currently working with several local grocery stores that are eager to offer food stuffs at discounted prizes. “We are looking at the places that can offer us good discounts so that we can deliver maximum stuff to workers affected,” he said. “The communities’ generosity is overwhelming and amazing,” Batt, the TSA official, said. Not every TSA agent is in need, but there certainly are many who are. Gift cards will be shared with those who truly have compelling stories of needs which need to be immediately met. To ensure that the community is able to offer helping hands to federal workers until the shutdown ends, the Sikhs in Fishers have vowed to mobilize the movement and encourage more Sikh temples and faith-based organizations in the central Indiana area to come forward in assisting in the coming weeks if needed. It may be noted that while the shutdown has affected a quarter of the federal government, the Transport Security Administration are amongst the worst hit of the group. TSA falls under the Department of Homeland Security and has about 60,000 employees. The TSA workers are one of the lowest paid employees and have been working without a pay for more than a month now. TSA also has a much larger minority concentration of employees with about 22.9 percent of them being African American employees, according to Bureau of Labor Statistics data. The Sikhs in Fishers is a growing community, which has grown from five families to more than 500 families. Recently, the community launched a $3 million building project.